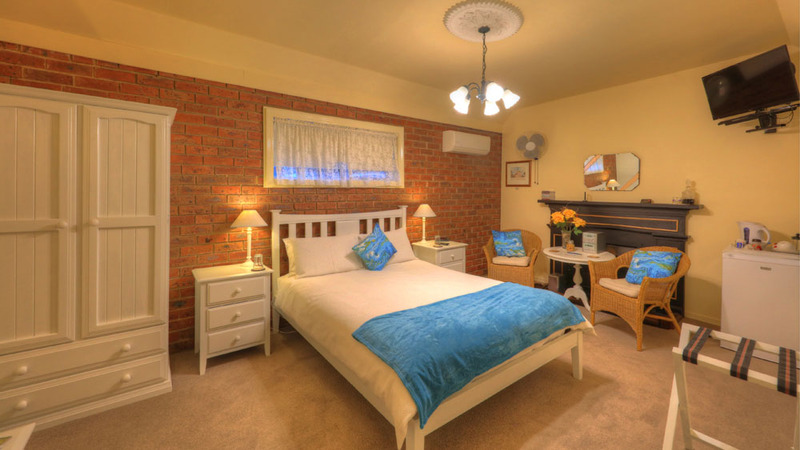 In the vibrant town of Heathcote, bringing the region’s plentiful attractions to your doorstep, lies Emeu Inn. Our character-filled B&B, offers deluxe and luxury Bed & Breakfast suites as well as a self-catering one-bedroom Cottage. The suites surround our beautiful garden whereas our entrance is on the main street. Indulge in the Heathcote region’s finest wines and fresh homemade fare at various venues in town. Your gracious hosts are on hand to help you with any bookings, tours or other whims. Go bush. Play golf. Or just be. Emeu Inn gives you the place and space to take time out however you want it. Book your unforgettable Heathcote experience at Emeu Inn online now or simply phone us on03 5433 2668. Deluxe suites have may have a double spa/shower combination or a single shower. You'll find large double spas separate from the shower in our luxury suites, Elly and Sage. If you are calling our delightful Cottage home, you’ll love slipping into its a large oval-shaped spa and private ensuite. You even have a kitchenette. Our long main street has lots of dining options from ethnic restaurants to pubs and fast food. We have lounges and the garden where you can get to relax with a cup of tea or glass of beautiful Heathcote wine. There are games, magazines and books, a CD player, tea and coffee making facilities, a mini bar and a fridge for your use. Secure off-street parking is available. The Heidi Suite and Cottage are pet-friendly, and you can bring your pet inside. Alternatively, Rocky, our resident dog, and Molly, our cat, all love cuddles and to play ball.